MOSCOW, Russia -- Ukraine's President Petro Poroshenko accused Russia of invading the country Thursday, apparently dashing hopes of a diplomatic response to the crisis and challenging the West to respond. 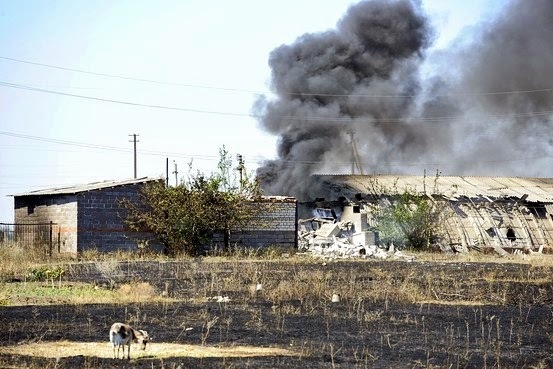 Smoke billows over a damaged building after shelling on the outskirts of the small southern Ukrainian city of Novoazovsk, eastern Ukraine, on Wednesday. Kiev said Russian forces have seized the coastal town of Novoazovsk and several villages near the border with Russia, part of a wider assault on a new front. Mr. Poroshenko called for an emergency meeting of the United Nations Security Council and the European Council to respond to what said was "the introduction of Russian forces into Ukraine." He canceled a planned trip to Turkey and set an emergency meeting with his security chiefs for later in the day. "The world needs to pay attention to the sharply worsening situation in Ukraine," he said in a televised statement from Kiev. Russia's ambassador to the Organization for Security and Cooperation in Europe, Andrey Kelin, denied the accusation. The Kremlin has repeatedly dismissed claims its forces are fighting in Ukraine. Western capitals have grown increasingly alarmed. France's President François Hollande said Russia would suffer a new round of sanctions if the Kremlin failed to stop the supply of arms to pro-Russian separatists and didn't respect Ukraine's sovereignty. "Russia cannot simultaneously aspire to be a world power in the 21st century and not play by the rules," the president said in a speech to French ambassadors. Lithuania's foreign ministry called the attack an "obvious invasion of the territory of Ukraine by the armed forces of the Russian Federation." The U.S. ambassador to Kiev also issued a definitive statement Thursday that Russia was now directly involved in fighting. The ambassador, George Pyatt, tweeted that "now an increasing number of Russian troops are intervening directly in fighting on Ukrainian territory." He noted that "Russia has also sent its newest air defense systems including the SA-22 into eastern Ukraine and is now directly involved in the fighting." The advance comes as a leader of separatist rebels in Ukraine confirmed for the first time that Russian active duty military are fighting in Ukraine—although he insisted the fighters were in the country for short stints, while on vacation. "I'll say openly that fighting among us are active military who prefer not to spend a holiday on the beach," Alexander Zakharchenko, prime minister of the self-declared Donetsk Peoples' Republic, said in an interview on Russia television. "They are among us brothers who are fighting for their freedom." Russia has repeatedly brushed off all allegations that it is aiding separatists or sending its troops there. Most recently, Russian President Vladimir Putin said Russian paratroopers Ukraine said crossed the border must have wandered there "by accident." After falling back before the advance in the southeast, Ukrainian troops are now digging in near the strategically important port city of Mariupol. Russia's Interfax news agency cited pro-Russian rebels as saying they will be taking the city "in the coming days." Ukraine's National Security and Defense Council said Thursday the assault on Novoazovsk on Wednesday was preceded by missile fire from across the Russian border, followed by the incursion of "two columns of Russian military equipment." The Council said "Russian forces" had taken control of Novoazovsk and surrounding villages, as well as villages further north, toward Donetsk. The Council didn't provide proof for its claim, however. NATO has a briefing scheduled for Thursday in which it is expected give fresh evidence of Russian forces directing military operations inside Ukraine. Until recently Ukrainian troops had the upper hand against rebels, pushing them back towards the Russian border and nearly surrounding strongholds in the cities of Luhansk and Donetsk. But in the past week Ukrainian defenses have crumbled under counter-attacks, amid reports that Russia was rushing troops and armor into the country into rebel-held areas. Ukraine's Prime Minister Arseniy Yatsenyuk called on Western countries to take harsher economic steps against Russia to help Ukraine fight off "Russian aggression." He said that sanctions taken up by the U.S. and the European Union have not been sufficient, and called on them and G-7 nations to "freeze all the Russian assets and to stop all the financial transactions of the Russian Federation… until Russia pulls out its military forces, armory and agents" from Ukraine. Anton Herashchenko, an advisor to Ukraine's defense minister wrote on his Facebook page that "to stop Putin, EU countries, and first and foremost Germany, must make a decision to give up buying oil, gas, timber and other natural resources from Russia," he wrote. "Stop issuing any kinds of loans or better freeze the assets of Russian state companies as sponsors of terrorism." "This will immediately put Putin on the brink of economic abyss which will sooner or later be followed by a political abyss," he added. Quote: "American officials also say the separatists have no experience in using such weaponry. It is called evidence and must be responded appropriately. In the court when criminal denies its gilt evidence is presented and judgment is maid unless, the criminal is insane. No one made any attempts to embarrass leaders in Russia; they are doing it to themselves.